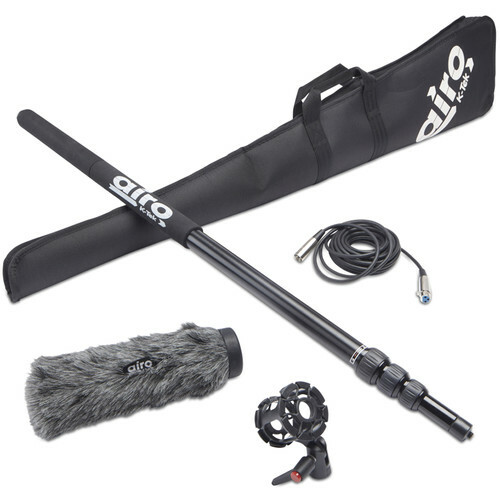 The K-Tek Airo Booming Intro Kit 1 combines a boompole, shockmount, XLR cable, fuzzy windscreen, and a padded kit bag to create the primary components of a professional audio recording setup for location or studio applications. Simply add a shotgun microphone and you'll be capturing content in no time. The uncabled ABP1 Aluminum Boompole 1 from Airo by K-Tek is a lightweight, four-section telescopic boompole that can be used for ENG, EFT, and other field recording applications. It features a collapsed length of 3.2' and an extended length of 10.8'. Other features include: a non-rotational tube set, rubber collar grips, a removable 3/8"-16 thread top attachment, and a removable anodized aluminum base. The uncabled ABP1 boompole weighs only 1.6 pounds, and easily collapses to store in any standard equipment case. The 25' AXC25 XLR Microphone Cable from Airo by K-Tek is designed for use with boompoles and microphone products. It has a 3-pin straight male XLR on one end and a 3-pin straight female XLR on the other end. The K-Tek Airo Fuzzy Windscreen 1 is designed to mitigate wind noise while recording on location. The windscreen uses open-cell foam and is covered by faux fur, which is made from natural-looking black and gray medium length fibers. The seamless front panel ensures optimal recording performance. The Airo Fuzzy Windscreen 1 fits most common shotgun microphones, such as the Rode NTG Series or Aputure Deity range. This windscreen can also accommodate microphones up to 0.89″ in diameter and has an internal length of 8.7″. Additionally, the internal length allows for most common microphones to be covered in a way that leaves an open "bubble" between the tip of the microphone and the fuzzy windscreen for clearer sound capture. The ASM1 Shockmount 1 from Airo by K-Tek is a rugged shockmount designed for boompoles and mic stands. It can be used to securely isolate a shotgun microphone from swinging and eliminate handling noise in ENG, EFP, and other field recording applications. The shockmount features two molded rubber suspenders. In addition, a threaded adapter is included to accommodate 5/8" mic stands. The black AKB1 Kit Bag 1 from Airo by K-Tek is a triangular-shaped boompole bag with room to transport a shockmount, windscreen, cables, and other audio accessories. It features a shoulder strap and a large zippered opening at the top, and is built with 600D polyester material, which is padded with an easy-view, gray interior. Measuring 46.5 x 9.9 x 3.2", the AKB1 Kit Bag's dimensions are large enough to transport your ENG, EFP and other field recording or application accessories. Box Dimensions (LxWxH) 41.6 x 3.3 x 3.3"
Box Dimensions (LxWxH) 5.0 x 4.4 x 2.0"
Box Dimensions (LxWxH) 10.0 x 3.2 x 2.4"
Box Dimensions (LxWxH) 4.8 x 3.9 x 1.7"
Box Dimensions (LxWxH) 17.0 x 6.4 x 3.9"